The right signs can bring your message to customers and prospects in your lobby during regular business hours or at an ATM 24 hours a day. InstantSign will help you create professional signage that accurately projects the desired image of your institution, increasing customer interest in programs and products. Give customers something to read while waiting in your drive-through lanes. 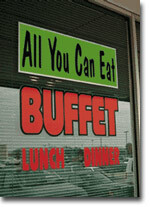 Signs can help acquaint them with your special programs and promotions, and can make wait times more tolerable. From lobby displays and boardroom presentations to ceiling danglers and counter cards, InstantSign gives all your graphics clarity, impact, and a crisp, professional look. Display your message in an unexpected and highly noticeable location. Whether placed in the queue or in your front entry, floor graphics are durable, removable and very effective. InstantSign has the technology and the design expertise to create banners bold enough to attract attention, yet professional enough to maintain your institution's image. Promote programs inside your location and exhibit at community events using one of our exhibit products. Initiate a banner program to promote various financial services throughout the year.